First of all, fastpasses are gold. 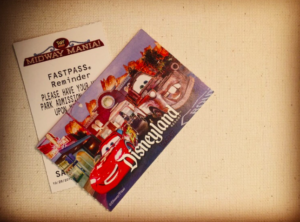 We did learn, however, that, while you can get multiple fastpasses for different rides (there are certain time restrictions and what not, but it is possible), you cannot get multiple fastpasses for the same ride if you have ones that have not been used yet. In other words, only one Toy Story Midway Mania fastpass at a time. So the prime time to get as many rides in as possible is right before closing. After the first World of Color show begins at 9:00 p.m., the lines go down from a 75-minute wait to a 15-minute wait. It’s the perfect time to improve your arcade game-technique. Now for the game tips. First, make sure you have a partner. Don’t go on the ride by yourself. You need a partner to help you through some of these check points. The first of the arcade games is the one on the farm with the animals. There isn’t much of a trick to this one. There’s a little fox in the bottom left corner that pops up. When you shoot him down, a few 1,000-point and 2,000-point chickens scurry across the bottom. There’s some down time between when you hit the fox and when the chickens are brave enough to come out, so make use of this time by firing at the other animals in the nearby area. There are also little stacks of mice that pop up at the end that are worth 1,000 points each, so be sure to keep an eye out for them. Then you’re onto the dart game. At the very top of the screen, there will be a volcano with a small, skinny lava balloon worth 500 points. Shoot this one, and more will pop up. Continue this pattern three times, and then the volcano will erupt a bunch of 500-point balloons. Then, this is when partnering will come in handy. From each side of the screen, comets will stream past. Hit them three times each. And, while we never reached this point, rumor has it, there are supposedly meteors worth tens of thousands of points that come streaming down the screen after this. The third game of the ride requires some partnership and plate-shooting skills. A few seconds into the game, two pink plates will fly up in the back of the scene, just behind the tanks that are driving across. If both you and your partner hit these plates, 5,000-point plates will then be fired in your direction for the remainder of the game, which is a huge point booster as well. The fourth game is one of my favorites. To get a huge point advantage in this game, team up with your partner to toss rings over all of the squeeze toy aliens in the spaceship before any of them have the chance to pop back up. Once you do this, the spaceship will take off and a monster will take its place. Every time it opens its mouth, you can shoot your rings into it, and each of those rings is worth a certain high point value (as shown on the forehead of the monster). The fifth and final game of the ride is the one with all of the targets. In all honesty, there isn’t much of a strategy to this one. When the mine carts start rolling towards you at the end of this game, be sure to hit each of the targets in each of the assembly lines (if you can only focus on one, only commit to one). The more targets on one line that you hit, the higher the point value of the final few targets will be. And, of course, there’s the final shoot out, where you hit the targets as fast as you can. Give it your all here. So those are all of the tips I have for Disneyland’s Toy Story Midway Mania. With them, my brother was able to get the high score of the hour at nearly 250,000 points, which I think is pretty solid (my highest was 178,000 even with all of these tips – I’m just not the most coordinated person out there lol). Do you guys know of any other secret point bonuses or tips in this game? Share them below in the comments!